Another side project of mine: The ever-popular, double exposure effect. This style/effect can be seen in many book cover, and film cover images. A great example is the art used in HBO's 'True Detective" series. I'm an avid reader of crime fiction, and mysteries. As a visual storyteller, this is an ode to my literary influences such as Raymond Chandler, Ross MacDonald, Elmore Leonard and many others. 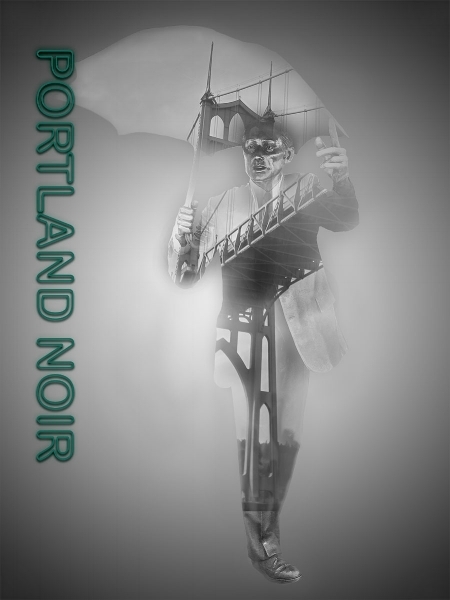 I photographed Portland's famous Umbrella man in Pioneer Square, along with the St. Johns Bridge from highway 30's vantage point. I then banged out this digital doodle in Photoshop. I think it sets a brooding mood: dark, with a fog-like confusion.